Jessica's got her best friend back(mostly), her comic is about to be launched(in the playground) an her nutty Aunt Joan has come to stay. The only ink blot on the landscape is Scarlett, Amelia's super-cool, super-annoying cousin, who just so happens to draw cartoons too. What?! Soon Jessica is fighting for her cartoonist life. It's a good job she has enormous badger on her side. One of my ARCs when I began blogging was 'My Best Friend & Other Enemies', the first book in the series which I rated really-highly. So, I was looking forward to a light-hearted, laugh-out-loud, packed full of wit, type-book in it's sequel. Despite all of that being there, I found that I didn't enjoy it as much as the first novel; whether I felt this because some of the pacing was quite slow, not all - there were points where I was pretty amused by the jokes thrown in, or because I've grown-up slightly and I know that this would make the perfect read for any 9-12 year-old who is just beginning to get into reading. Although, this novel definitely had some great messages to learn inside it, from the world of our main-character Jessica; it was packed with life-lessons on arrogance, confidence, jealousy and friendship, all of which are really important. 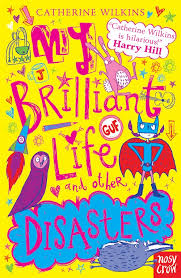 Catherine Wilkins' writing really does reflect the life of an eleven year-old, and it's definitely a honest reflection of what Primary School is like - as I was there only a few years ago! Of course, it wouldn't be the series I initially loved if not for the over-exaggerated, and hilarious, competition between neighbours over who's child is doing better in school, and the representation of love/hate relationships in your family when they won't buy you Kit Kats and your Dad always has to offer your Mum a cup of tea to calm her down. These smaller-aspects of the novel were my favourite parts of this book - as you could see the author wasn't forcing all the humour at you, and trying to continuously leave you laughing, but instead family-life is just a funny thing - and rightly so. You can relate to the family in this book, and the neighbours you may know, to the characters in this book, and it makes it easier to picture. The storyline itself was great - it begins where the first book left off - Jessica and her friends are publishing(Printing) out a comic that will be spread around the school, and despite it only being popular in the playground, you get a sense that it is something bigger, and it really brings you back to how school is really the only thing you know when you're young(not that I'm old, or anything!). I was glad to see the continuation of a storyline that saw Jessica being left-out by who she thought was her best friend, because a new-girl, Amelia, joined her class, was still there. Jessica overcoming how she felt towards Amelia was definitely a hard-task for her, but also not just 'running back' to the friend who left her alone was something I wanted to see, and did see. This novel was about friendships and honesty, and shows how people may not believe you. Jessica's arrogance, as I mentioned above, became annoying, for lack of a better word, something I think was purposefully done to give a clear-message that you should always be modest and stay grounded, or you will loose those around you. Admittedly, I did have a few problems with this book; and I was a little disappointed by the fact it didn't have the same originality as the refreshing first book. Some times, despite being able to relate to Jessica's family-life, I noticed the same situation had happened only a few chapters ago, or that the same joke was being recycled, and I wanted something new! There were parts in the book when I wanted something to happen, where Jessica would realise how arrogant she had become and start to resolve things, or for more excitement, as there wasn't much of that until the final chapter, where I liked what happened and wished I had seen more of that wit in the previous one hundred and fifty pages. I'm not, by any means, saying this is a bad book. As it's not. There's no doubt you will find yourself laughing throughout, or that it will teach you a few life-lessons no matter how old you are. Thank you to Dom at Nosy Crow for providing me with a free-copy of this book in exchange for an honest review! Yeah your view change on a good book when you grow up because you know what to look for in a good book. I love reading books like these every once in a while, they are so fun to read :D It's annoying that you didn't enjoy it as much as the first one but it makes sense if your reading taste has changed. I like how the author picked up the second book right where the first one left off. It is so much easier to get sucked into a book that way. It sounds a lot like Me, Susy P! :) Great review, Sophie. I'm currently reading fun, light-hearted reads and I was quite scared that I wouldn't enjoy them (read the first four in the series when I was younger), because I'm older now but luckily the author has written them in the way that will appeal to anyone of any age! It's annoying how that can happen, when you read a book by an author you previously loved but now when you read the books you start seeing flaws, as Francoise said, because you're older now. I'm sorry you didn't enjoy this as much as you hoped you would!